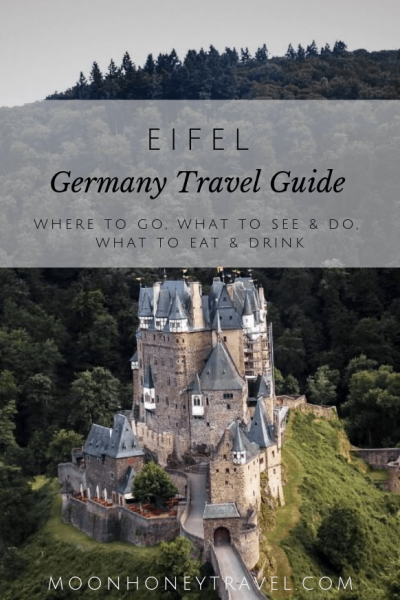 The Eifel is a region in Germany that boasts some of the loveliest fairy tale towns and medieval castles in the country. Overlooked by most foreign travelers, this region is one of Germany’s best kept secrets. The Eifel is largely rural and quiet, characterized by agriculture, farmland, and woodlands. Sprinkled between pastures of grazing cows and thick forests, you’ll see tiny towns, in which the most prominent buildings are the churches. The Eifel is also a low mountain range in eastern Belgium and western Germany. In Germany, the Eifel region borders Belgium, the Moselle River, the Rhine River. 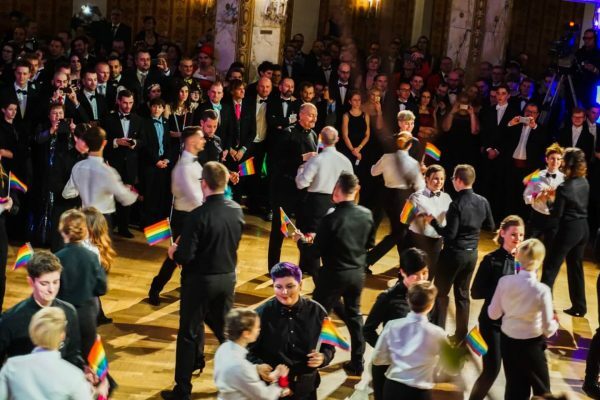 If you’re looking at a map, it encompasses the area between Aachen, Trier and Koblenz, in the states of Rhineland-Palatinate and North Rhine-Westphalia. Geologically, this region was shaped by volcanic activity. Although the last volcano erupted about 10,000 years ago, evidence of the Eifel’s turbulent past can be seen in the crater lakes, called maars, that pepper the Vulkaneifel landscape. There are different ways to enjoy this area. 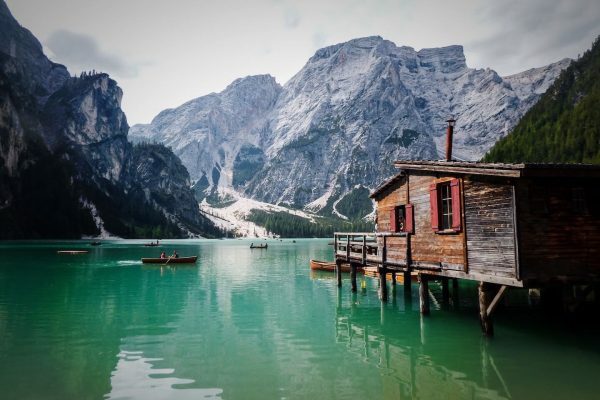 For nature enthusiasts, there are tons of gentle trails and wildlife parks. You can hike a stage of the 313 kilometer Eifelsteig trail, or visit the Eifel National Park. For architecture admirers, there are beautiful castles and medieval towns to visit. And for those who want a respite from a busy travel schedule, the Eifel has several thermal bath (Therme) destinations. The Eifel also encompasses the Ahr Valley (Ahrtal) and parts of the Moselle Valley (Mosel). For outdoor activities, it’s best to come here in summer, as the weather is “consistently” warm. If you’re interested in visiting castles, you should come between late Spring and early Fall, as most of them are closed during the Winter season. Click the dots on the map to explore specific destinations. You can expand the map by clicking the icon on the top right corner. Wo Fels und Wasser Dich begleiten. Just you, the water and the rocks. 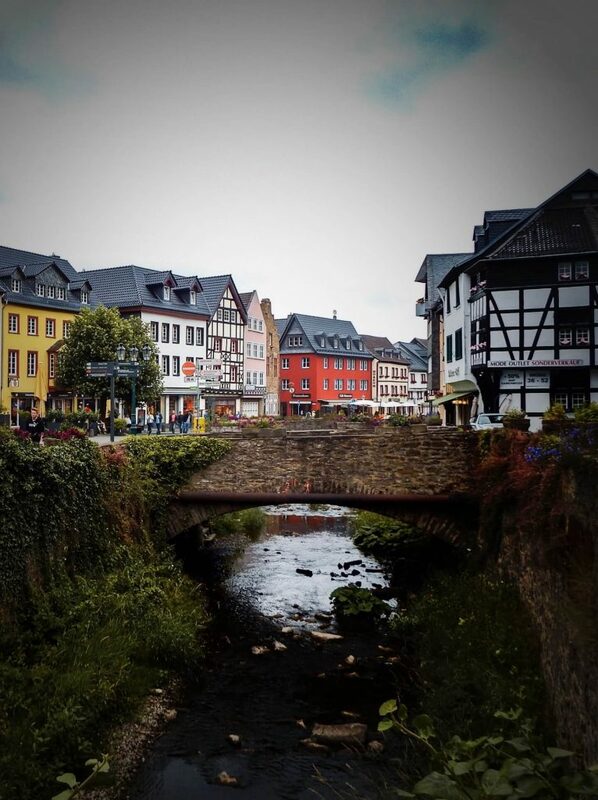 Monreal might be the best kept secret in the Eifel. 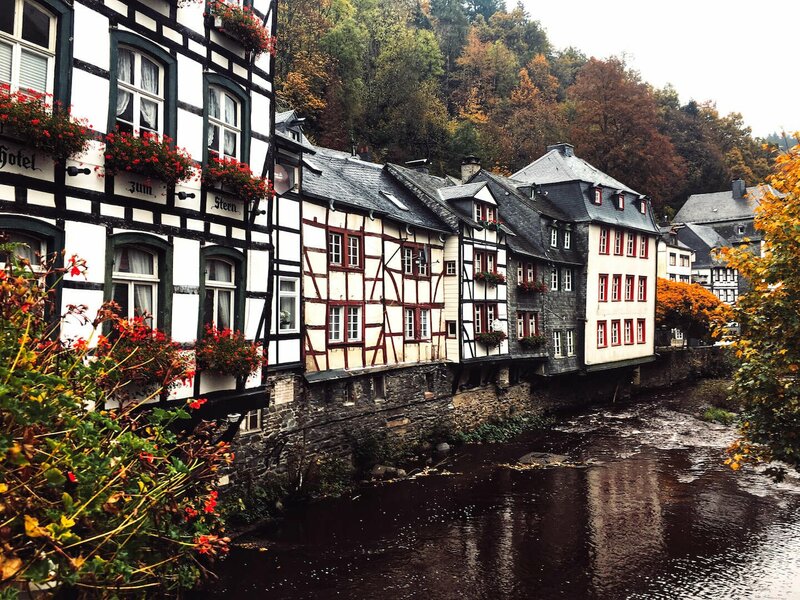 Monschau attracts all the attention, leaving idyllic Monreal quiet and unspoiled. This tiny village is concentrated over the Elz river in a narrow valley. Several of Monreal’s historic half-timbered houses date back to the mid-1400s. And as you’d expect, there are castle ruins (Löwenburg and Philippsburg) that handsomely overlook the village. When we visited in early July, window boxes were in full bloom and the facades of the houses were framed with rose vines. Recommendation: Eat Flammkuchen at Arenz am Malerwinkel (Marktplatz 4, 56729 Monreal). In addition to Flammkuchen, the restaurant serves Eifel beer and regional wine. From the restaurant, there’s an enchanting view of half-timbered houses and castle ruins. 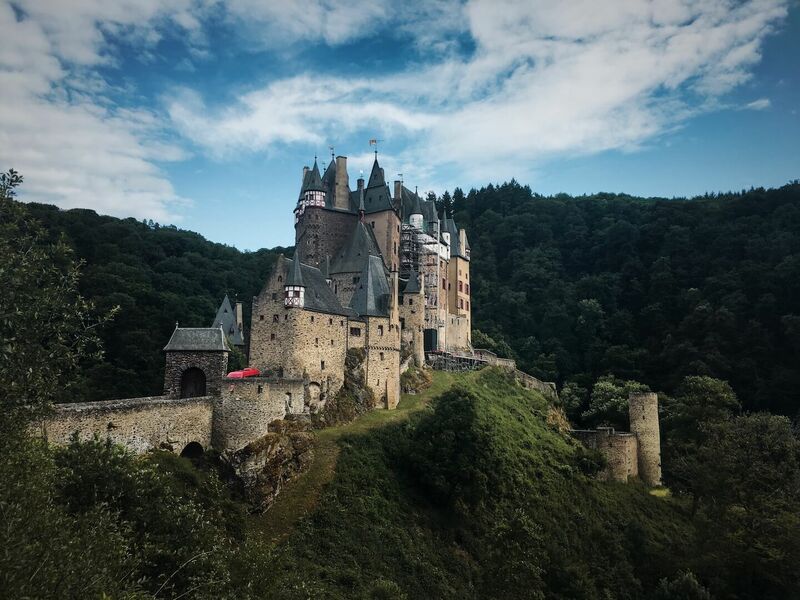 Eltz Castle is easily the most enchanting medieval castle in Germany. The castle is perched on a steep rock in the middle of a wooded valley. 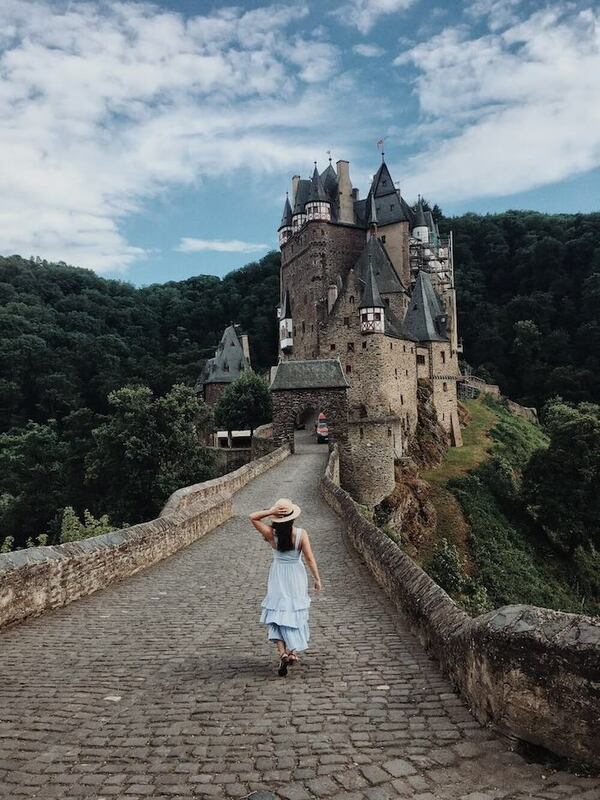 Fully encircled by forest, Burg Eltz stands prominently isolated from all modern society. The effect of seeing the castle with its green backdrop is nothing short of bewitching. Apart from the excellent view of the exterior, it’s also possible to see the interior of the castle via a guided tour. 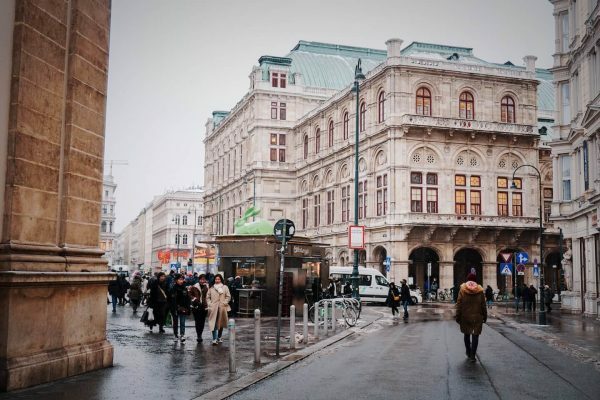 Tours are conducted regularly in German and English and cost 10 EUR (Adult). 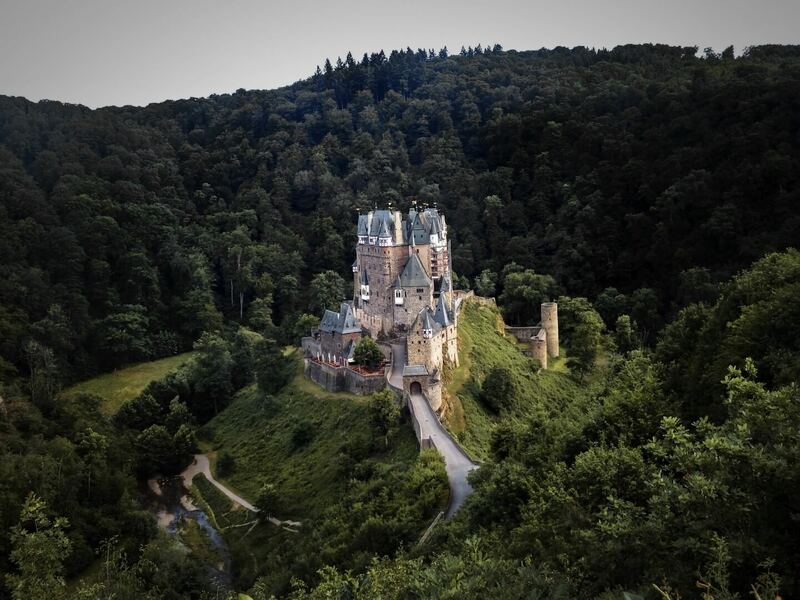 Unlike most castles in the region, Burg Eltz was never destroyed. And for that reason, you’ll see authentic medieval furniture, original 17th-century Flemish tapestries, Chinese porcelain, weapons, and armor. The most impressive room is the master bedroom. The walls and ceiling are painted in green spirals, evocative of vines, with accents of red and yellow flowers. The fireplace is draped with a tapestry, and the bed has gold curtains. There’s also a chapel in the bedroom, because there’s an old tradition that mandates that no one can live above god. And, there’s a toilet in the bedroom that can be flushed with rainwater. Getting to the Castle: From the parking lot, you can either take a shuttle bus down to the entrance of the castle (2 EUR), or you can opt for the footpath. The footpath is 1.8 km and descends gently to the castle. When to Visit: April 1st – November 1st. Opening Hours: Daily, between 9:30 a.m. and 5:30 p.m.
Best View: The best views are from the road (where the shuttle bus drives). If you opt for the footpath going to the castle, make sure to hike up the road on your way back to the parking lot. About half way up there’s a vantage point that offers an unforgettable bird’s eye view. Bad Münstereifel is a historical spa town in the Eifel. The old town is contained within a preserved medieval wall and is largely pedestrianized. After entering the town via one of four city gates, you’ll walk through cobblestone streets lined with 17th century half-timbered houses. The townscape is further enhanced by the the Erft river and the ten stone bridges that arch over the water. Positioned above the city, you’ll find a 13th century castle. The castle is privately owned and contains a restaurant. For a short visit, we recommend sitting at one of the cafés along the river. We also, recommend walking a section of the medieval wall. Deep in the Eifel, in Daun, there’s a drivable wildlife park (Wild- & Erlebnispark Daun). This is a great activity for families with children, but also for anyone who loves animals. 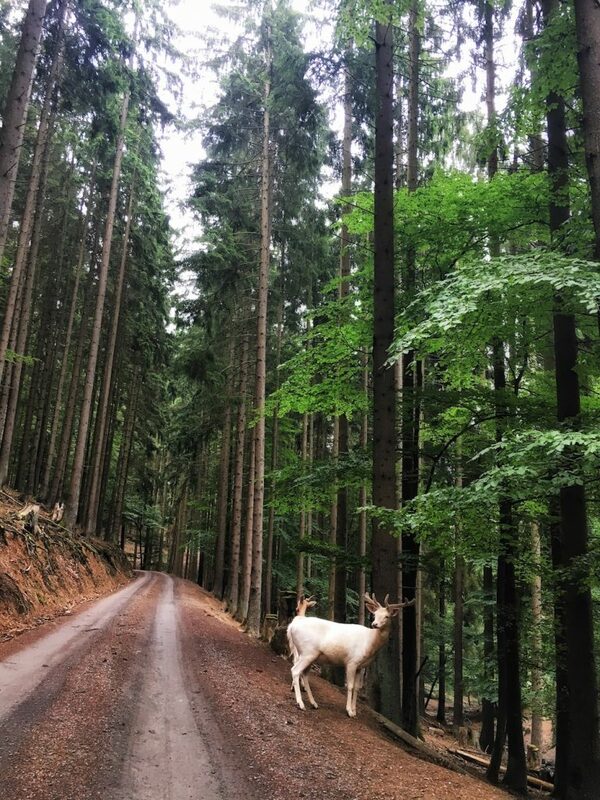 As you meander through a thick forest, you’ll be able to park often and feed free-roaming wildlife. When you purchase your entrance ticket (10 EUR per person), you can buy boxes of animal food (in German: Futter). The first stop is a walkable 6-hectare enclosure that houses 52 Berber monkeys. The monkeys walk freely throughout the wooded area. We saw at least 20, including a mother feeding her baby. Directly across the monkey canyon, there’s a large bird exhibition area. During your visit, you’ll see emus, red deer, fallow deer, sika deer, yaks, wild horses, lamas, meerkats, wild boar, donkeys, sheep, bison. The wild boar get really excited when they hear/see a car, because they associate it with food. Don’t be alarmed if 30 pigs come charging in the direction of your car. Also, the emus and lamas are not shy. At one point during the drive, we waited a considerable amount of time for a group of lamas to clear the road. 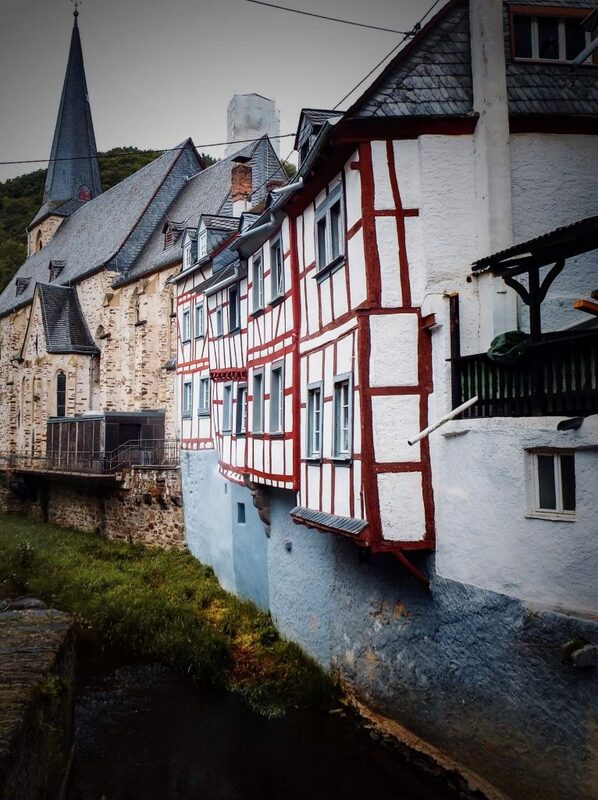 Monschau is the main tourist attraction in the Eifel. It looks like the setting for a German Märchen (fairy tale). 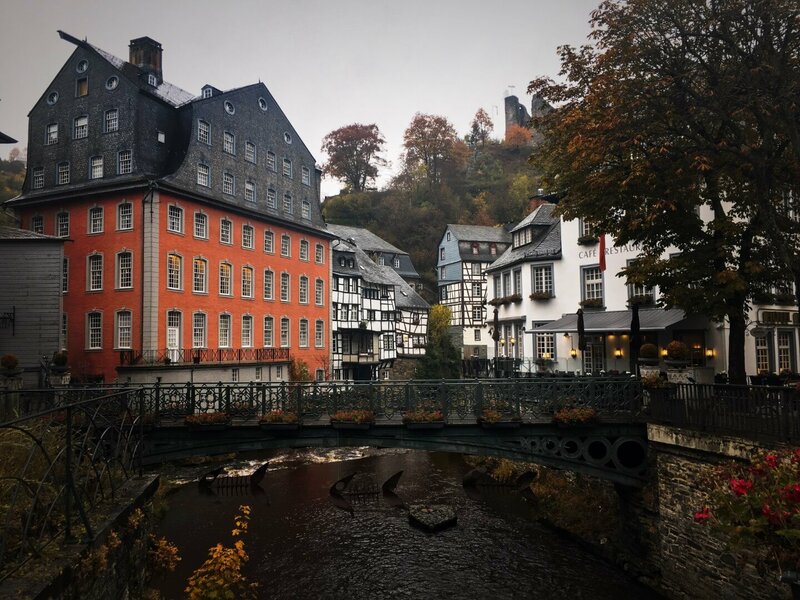 Celebrated for its preserved townscape with half-timbered houses and narrow cobblestone streets, Monschau is an exemplary model of a Rhineland medieval town. 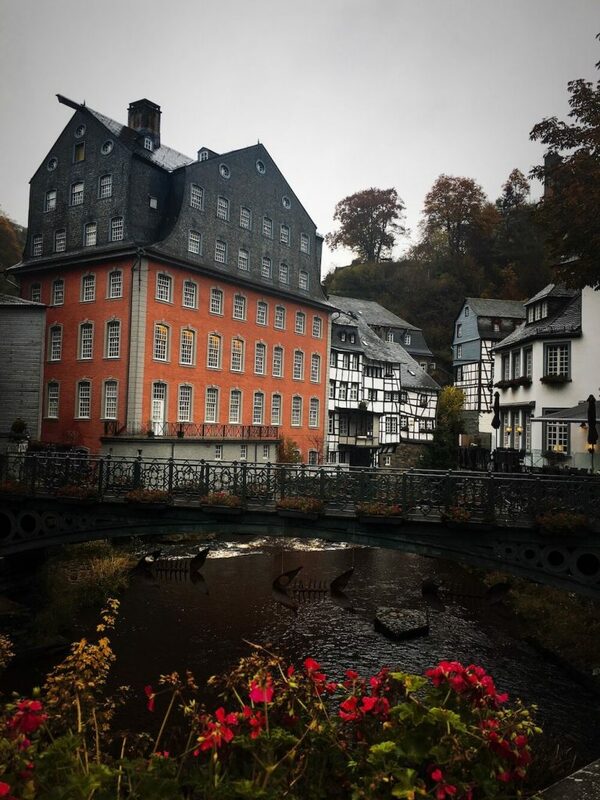 With the small River Rur running through the historic center, Monschau is indisputably charming. There is an annual classical music festival that takes places each summer at Burg Monschau. In Winter, there is a Christmas Market. The Eifel National Park is a 110 square kilometer conservation area in North Rhine-Westphalia, home to the largest population of wild cats in Central Europe. 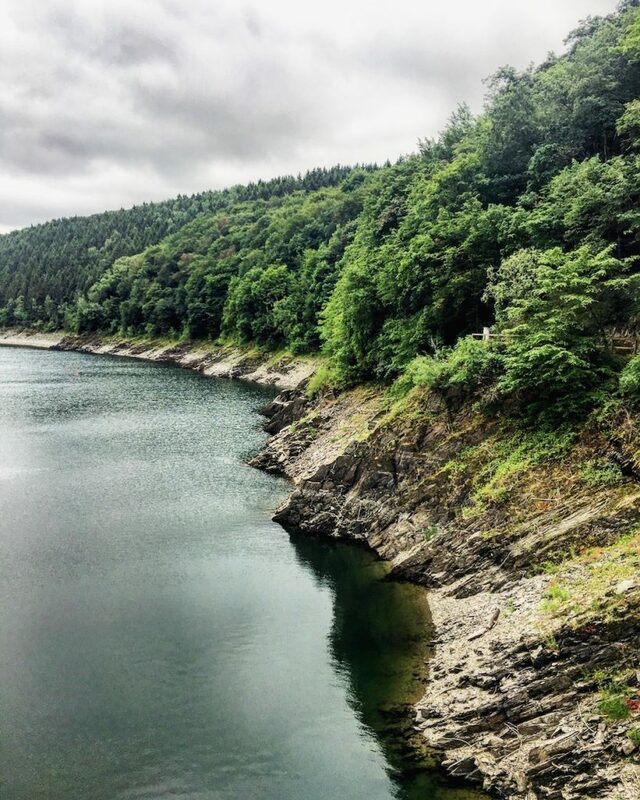 With about 240 km of paths open to visitors, the Eifel National Park is a nice destination for gentle hikes and mountain biking. We hiked the 16 km Wasserland trail, which starts in Einruhr and winds around Obersee and Urftsee. You can shorten this hike by taking the Rurseeflotte Boat (April – October) from Urftseemauer back to Einruhr (recommended). Vulkan – regional beer. The brewery is located in Mendig (Laacher-See-Straße 2, 56743 Mendig). Bitburger – regional beer. The brewery is located in Bitburg (Roman wall 3, 54634 Bitburg). 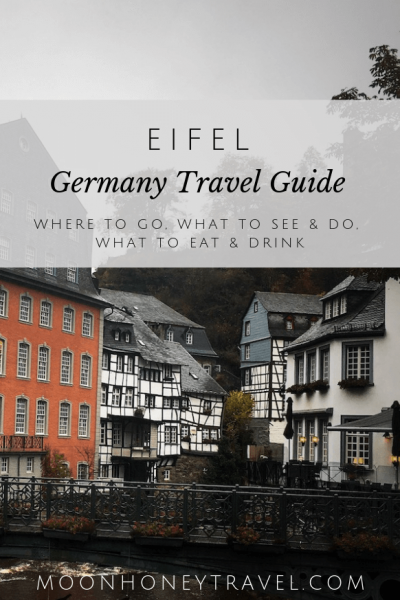 Given the Eifel’s proximity to the Rhineland, the food is heavily influenced by that region. Flammkuchen – Alsatian pizza. Thin rectangular dough topped with various vegetables, cheeses, and meats (no tomato sauce).